Ceres-La Salle Football Club had much to be thankful for when they defeated Brunei DPMM FC by a scoreline of 3-0 in their first leg clash last June 30, 2016. For starters, that scoreline virtually sealed their ticket to the 2016 Singapore Cup semi-finals. 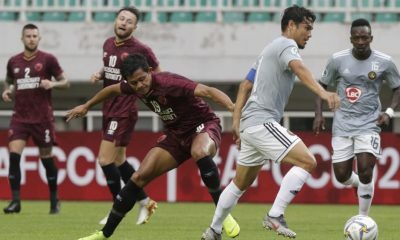 In addition to that, the performance suggested that Ceres-La Salle could so easily breakdown DPMM again in the second leg tonight at the Jalan Basar Stadium in Singapore. 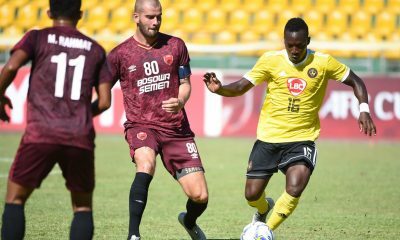 True enough, Ceres-La Salle broke down DPMM courtesy of goals from Stephan Schrock (16′) and Bienvenido Morejon (53′) to kill off the contest. With pride left to fight for, though, DPMM were determined to score goals to make the scoreline look more respectable. DPMM did more than that and successfully retaliated by scoring three goals of their own. Shahrazen Said (54′), Rafael Ramazotti (63′) and Brian McLean (90′) completed DPMM’s comeback, although it was a case of too little too late. DPMM may have ended up as 2-3 winners on the night, but it was Ceres-La Salle who go move to the next round due to a 5-3 aggregate score. 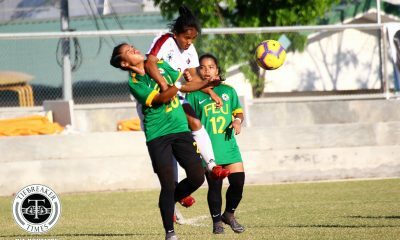 Momentum was on the side of Ceres-La Salle before kickoff and the Bacolod-based team’s vigor was on show in the game’s opening moments. Schrock had an early attempt on goal caught by DPMM goalie Wardun Yussof. He then volleyed the ball home after a touch by Jeffrey Christiaens at the 16th minute to give DPMM a mountain to climb. In spite of the setback, DPMM didn’t allow their heads to drop and were eager to add some dignity in the aggregate score. 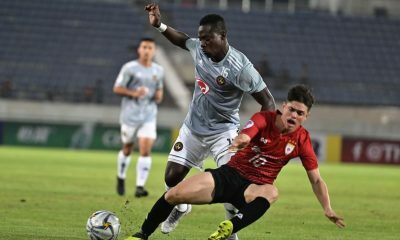 DPMM’s Portuguese midfielder Paulo Sergio unleashed a shot parried away by Ceres-La Salle goalie Louie Casas and created an opportunity for Azlan Saleh which was squandered at close range. At the other end, Christaens penetrated the DPMM box only for his shot to sail wide. Ceres-La Salle enjoyed a 1-0 advantage over DPMM at the break and were well on their way to a first semi-final appearance in this competition. Not content with a one-goal lead, Ceres-La Salle pushed on for another to put DPMM out of their misery. Ceres-La Salle got the goal they craved at the 53rd minute with Morejon scored his via a chip which left Yusson immobile. At five goals down in terms of the aggregate score, DPMM could have been forgiven if they just wanted to let the game pass without conceding anymore goals. Nevertheless, this decorated club has a lot of price in them which was shown in the next thirty-six minutes of the second half. Immediately after Morejon’s goal, Said pulled one back for DPMM at the 54th minute from close range. Said’s goal rejuvenated DPMM. Part of that rejuvenation was Ramazotti whose shot destined for the upper right corner of the Ceres-La Salle goal forced Casas to make a fine save. Ramazotti, however, wasn’t to be denied when he headed the ball into the Ceres-La Salle net at the 63rd minute to level the game. The game suddenly became open with Ceres-La Salle and DPMM sought the match-winning goal. Both clubs had their chances. The night, though, belonged to DPMM just when it looked like the match was going to end in a draw. McLean converted Sergio’s cross right at the death to help DPMM regain some pride. Nonetheless, Ceres-La Salle’s good work in the first leg paid dividends and it was them who march on to the next round. Up next for Ceres-La Salle is Singaporean club Tampines Rovers. The Rovers defeated the 2016 United Football League Cup winners Global FC by an aggregate score of 5-2 in order to reach the semi-finals. As of this writing, there is still no word about the details concerning the said fixture except that it will also be a two-legged affair.